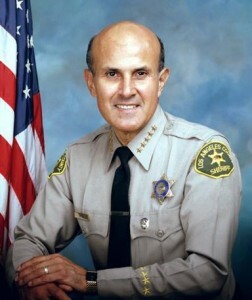 Lee Baca retired from the Los Angeles County Sheriff’s Department in 2014 at the height of the federal probe. He had been sheriff since December 1998. LOS ANGELES – An FBI agent testified Monday that a pattern of email exchanges and phone calls to former Sheriff Lee Baca at significant times in a corruption scheme the retired lawman is alleged to have authorized show that he kept in close contact with subordinates who conspired to thwart a federal jails probe. The flurry of contacts “show the involvement” of Baca and various sheriff’s officials who were subsequently convicted in the conspiracy, Leah Marx, the lead FBI agent in the case, told jurors on the ninth day of Baca’s retrial on federal corruption charges. The frequency of messages and the way the calls corresponded to important events in a timeline of the case prove that all roads “go back to one person,” Marx said, referring to the 74-year-old defendant. Under questioning by a government prosecutor, Marx explained the meaning of visual aids meant to illustrate that a burst of calls to Baca’s phone numbers took place immediately before or after significant developments — such as the discovery that a contraband cell phone belonging to the FBI had been found in the jail, the arrival of a federal writ for an inmate-turned-informant, and the news that a former deputy confessed to beating up inmates. Assistant U.S. Attorney Brandon Fox also used clips from an interview Baca gave under oath to federal investigators in April 2013 to bolster a false statements charge against the ex-sheriff. At one point, Baca said that “as this whole thing emerged, Captain (Tom) Carey would call me and tell me” what was going on. However, records show that convicted former Undersheriff Paul Tanaka seemed to be delivering many of the updates either on the phone or in closed-door meetings, according to Fox. When he questions Marx on Tuesday, Baca’s attorney, Nathan Hochman, is expected to try and show that phone and email records offer little evidence of the then-sheriff’s involvement in the conspiracy. Fox said he expected to rest his case Tuesday after he calls two more witnesses to the stand, followed by Hochman’s defense case. Last week, Carey, who is awaiting sentencing for lying under oath in a related trial, spent several days on the stand responding to questions about Baca’s alleged involvement in the conspiracy to hide a county jail inmate-turned-informant who was working for the FBI to expose alleged brutality against detainees in Men’s Central Jail in 2011. Fox hoped to use Carey’s testimony to show that Baca was at the very top of a complex scheme to keep jail inmate Anthony Brown from giving evidence to a federal grand jury about alleged use of excessive force by jail guards against detainees. Baca is being tried in downtown Los Angeles on counts of obstruction of justice, conspiracy to obstruct justice and making false statements to the FBI. The retired lawman was tried in December on the first two counts; prosecutors had planned a second trial on the lying count. But a mistrial was declared after jurors deadlocked 11-1 in favor of acquitting the former sheriff, and U.S. District Judge Percy Anderson combined all three counts in the retrial, which began Feb. 22 with jury selection. The charges partly stem from a 2011 incident in which two sheriff’s investigators confronted Marx in the driveway leading into her apartment and falsely told her they were in the process of obtaining a warrant for her arrest. Baca denies having advance knowledge of the illegal attempt to intimidate the agent. Carey testified that he heard Baca give advice to deputies before they left to confront the agent. The defense says it was really Tanaka, Baca’s top deputy, who ran the conspiracy. Hochman maintains his client was a victim of the now-imprisoned ex-undersheriff and his hidden agenda to retaliate against the FBI. Carey and eight other former deputies were convicted in the case. Baca’s second trial differs from the first. Anderson has barred Hochman from putting on evidence of “prior good works” related to Baca’s more than 15 years as leader of the sheriff’s department, ruling that such evidence does not directly pertain to the charges for which he is being tried. The judge also banned Baca from wearing a small sheriff’s star he wore on his lapel on each day of the first trial. Baca’s attorneys contend the ex-sheriff is in the early stages of Alzheimer’s disease and suffered some cognitive impairment as long as six years ago. If convicted of all charges, Baca faces more than 20 years in federal prison, according to prosecutors.